help from us both in regard to design and development of its new website. We helped DonsöData with their new website which we used Joomla 2.5 to build. 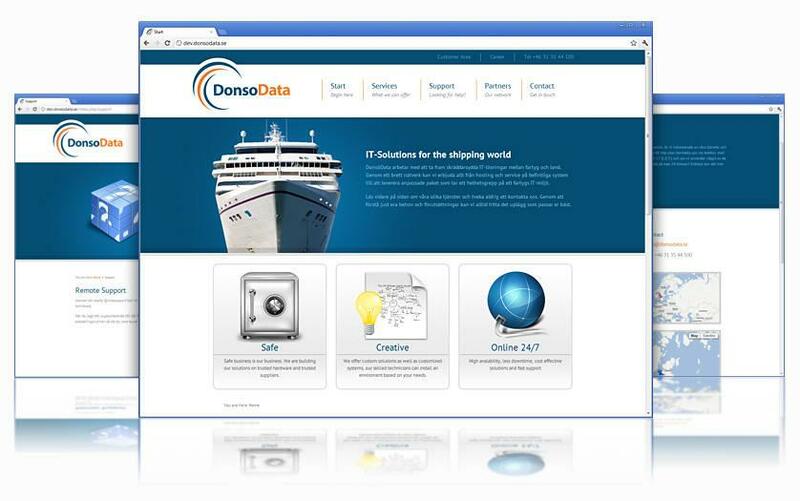 DonsöData works with maritime IT solutions and has received help from us both in regard to design and development of its new website. Since they work with both Swedish and international customers there are Swedish as well as English versions of the site. We also worked with keyword optimization for the site and created a specially adapted Facebook page that collects information directly from the website. For this project we installed JFBConnect, sh404sef, MaxiMenu, Xmap, AdminTools, Akeeba Backup, JCE text editor and WidgetKit as well as other components. DonsöData.se has multi-language support and the entire site is accessible in both Swedish and English. We also worked with SEO, hyperlinks and helped to write sales texts.